February 26, 2010  Expectations were high for Russian athletes in Vancouver, but an underwhelming showing has left Russians at home full of disappointment and shock — and looking to 2014, when Russia will host the Winter Olympics. 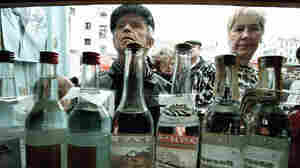 February 24, 2010  Every Russian leader, it seems, finds a new way to try to confront the country's addiction to alcohol. Now, it's President Dmitry Medvedev's turn. His approach: declaring war on cheap vodka. Vendors are now required to charge at least 89 rubles — or about $3 — for a half-liter of Russia's favorite drink. February 23, 2010  In Russia, protests are generally small and often shut down by police. But recently, police have allowed a handful of anti-government demonstrations to go on. 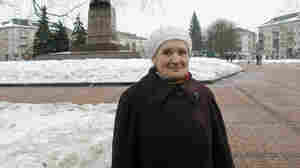 The prime minister says getting feedback from citizens (like 72-year-old Leokadya Maximova) is a good thing. February 8, 2010  Russia-friendly candidate Viktor Yanukovych held a narrow lead Monday in Ukraine's presidential runoff election. His opponent isn't ready to concede, saying it's too close to call. 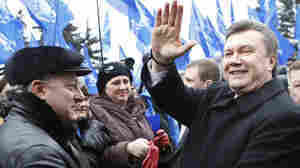 If Yanukovych is the victor, that could restore much of Moscow's influence. February 5, 2010  Ukrainians vote in a runoff presidential election Sunday, five years after the Orange Revolution swept in democratic reforms. If the pro-Russia candidate wins, Ukraine could re-establish ties with Russia, and one of Europe's major democratic revolutions could become a memory. February 1, 2010  NPR's David Greene took up his new assignment in the former Soviet Union aware of its reputation as a cold and distant place. He learned differently from some new Russian friends living in Ukraine that the locals can be very hospitable and that "teatime" can sometimes mean cognac instead. January 17, 2010  In the Ukraine's first presidential election since it's Orange Revolution five years ago, Viktor Yanukovych leads the polls. But in 2004, Yanukovych was the revolution's enemy, the Russia-backed candidate who won the tainted election and had his victory thrown out. January 15, 2010  Ukraine holds its next presidential election Sunday, five years after thousands of Ukrainians protested a tainted vote in what became the Orange Revolution. Ultimately, the results were thrown out and the opposition won the new election. But just a few years later, the revolutionary mood has soured.